Not applicable, of course I do. One State should not dictate policy, ever. Of course not, but if "All Men are Created Equal," then every citizen should have equal representation. You may be happy that each citizen of Wyoming gets a greater say as to who is president or who sits on the Supreme Court than a citizen of NY or CA, but that goes against one of the founding principles of this nation. And when the constitution was ratified we didn't exactly have the massive variations in population between states that we do now. Of course not, but if "All Men are Created Equal," then every citizen should have equal representation. You may be happy that each citizen of Wyoming gets a greater say as to who is president or who sits on the Supreme Court than a citizen of NY or CA, but that goes against one of the founding principles of this nation. And when the constitution was ratified we didn't exactly have the massive variations in population between states that we do now. California currently has 55 Electoral votes and Montana has THREE. Now tell me how Montana and its voters have a bigger say than California?... C'mon man, the Fathers got it right, otherwise this would be the United States of Caliyork. What he's referring to is the ratio of residents:electoral votes. States with smaller populations sometimes carry more electoral power because of the 3 electoral minimum. CA 39M:55 = means 1 electoral vote represents 709K people in California. WY 579K:3 = means 1 electoral vote represents 193K people in Wyoming. Therefore, a vote cast in Wyoming carries more than 3 times the weight of a vote cast in California for a national election. Even Trump called the Electoral College unfair, until of course it benefited him. The definition of a good compromise is that both sides feel they got short changed. Maybe the founding fathers knew what they were doing. Hillary Clinton didn't bash the electoral college when Trump got elected. It is truly weird how they react to criticism of Trump as if they are extensions of the Master's Will and it is criticism of themselves. Saw a recent poster here bellyaching how folks think he is a POS if he likes the prez. x2. It’s very telling. I think Obama “fans” behaved the same way, but when you compare the character of each President.......sheesh! If you believe you relate to Obama, good for you. 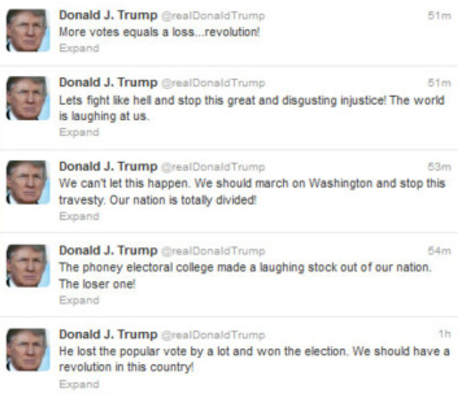 If you feel you relate to Trump, then I’m so sorry, and I hope you get they help you need. The definition of a good compromise is that both sides feel they got short changed. Excellent. To whom is this quote attributed? Maybe the founding fathers knew what they were doing. I'm sure The Cult of Trump members will be along soon to defend this. It is truly weird how they react to criticism of Trump as if they are extensions of the Master's Will and it is criticism of themselves. Saw a recent poster here bellyaching how folks think he is a POS if he likes the prez. Strange how they identify so completely with their idol. Creepsville. That is so horrible but there were also remarks about the Washington Post reporter Jamal Kashoggi's killing that were troubling. Democrats attack President Trump for defending the U.S. border. When Obama did the same thing, the Democrats remained silent. The Democrats now use hypocrisy instead of patriotism. When hundreds of illegal migrants attempted to storm past the U.S. border on Sunday, border patrol agents engaged the mob — and when the crowd began hurling rocks and debris, authorities deployed tear gas. So where were these complaints in 2013, when former President Barack Obama’s border patrol did the same exact thing? “In 2013, during the Obama administration, Border Patrol agents reportedly used pepper spray to fend off a group of approximately 100 migrants who attempted to rush the same San Ysidro port of entry”. A San Diego Union-Tribune article at the time said agents fired "pepper balls" and used other “intermediate use-of-force devices” to repel the crowd. The migrants in that confrontation also reportedly threw rocks and bottles at U.S. authorities. But with the national spotlight on Sunday's caravan clash at San Ysidro, Democrats are lashing out at the Trump administration. The latest confrontation with caravan members has captured lawmakers' attention. The clash Sunday came as hundreds of migrants from a caravan that originated in Central American pushed past Mexican riot police and rushed the border at the port of entry in San Ysidro. "7 nooses found by Mississippi Capitol before Senate runoff"
Sounds like the Obama admin was enforcing border security. Then why are you always screeching how Obama was against a secure border? I guess the point is that both Administrations have done it. So, you are either for it, or against it. No problem. My opinion is moot, a pipe dream of an uattainable world of cooperation and prosperity. So nothing to argue about, the Babylonian warring nation-state paradigm isn't going away anytime soon. We all have our Quixotic visionary quirks, like actually living the teachings of Christ, or having a Libertarian in the Whie House. Not "unattainable"...just not going to happen until every nation carries its own weight. No one wants to consistently carry or support anyone. Marriages, friendships, neighborhoods etc. Everyone is successful and content when the load and responsibility are shared by all involved.
" Why is the Immigration Problem so Difficult"
A U.S. Flag or two might even send a positive message. Gotta agree they are a-holes with their ridiculous flags. 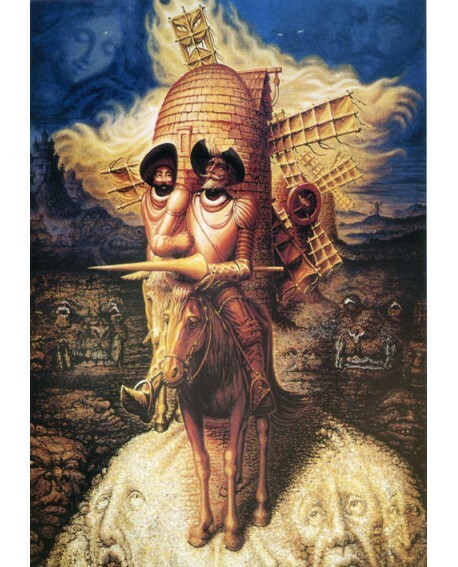 Btw BigV, the Don Quixote optical illusion painting is by Octavio Campo, a Mexican artist, his work is handled in the US by a gallery in Sedona, north side of town on 89a, originals hanging there, he did a great John Lennon, same composite illusion style. And why would Trump copy his most hated nemesis that he thinks is a horrible failure? Since you use other people’s talking points instead of your own words, what is the definition of the “mainstream media”? Gotta love the people that bash the mainstream media as they post a link from the mainstream media and cite the mainstream media as fact. Mule is shocked to hear that politicians play politics in Washington.